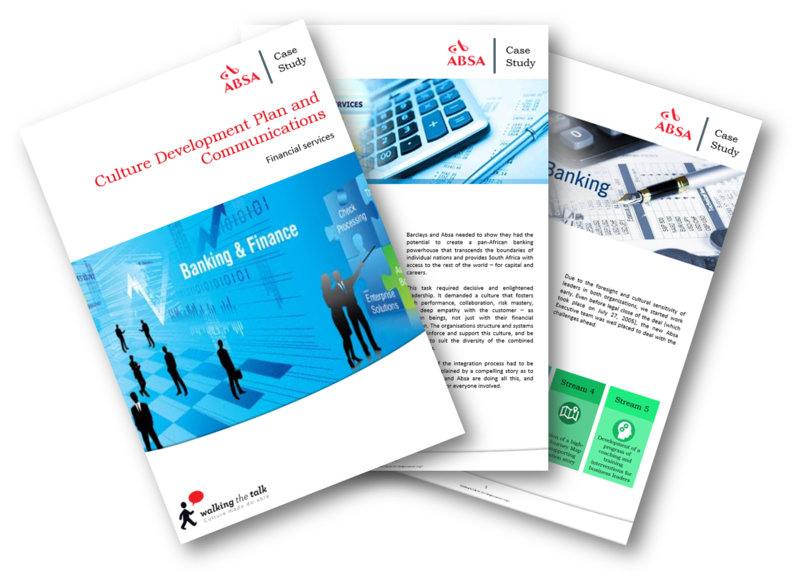 Thank your for your interest in our ABSA Case Study - Culture Development Plan and Communications. To download just complete and submit the form. We worked with a joint Barclays/ABSA client team to establish the leadership and cultural conditions for success of this transaction. This was the largest single investment ever made by Barclays outside the UK, and the largest direct foreign investment ever made in the Republic of South Africa, at almost £3 billion for Barclays to acquire up to a 60% stake in ABSA. Our role was to help Barclays make the critical connections to be built into the fabric of ABSA, as a new member of the Barclays Group. These connections could not be constructed of strategy, policy, procedures and technology alone. They had to be stronger, human connections that would open the doors of emotion, attitude and understanding of Barclays/ABSA people and stakeholders.